The various types of free appliques can be used as either patches or embellishments. When choosing a free applique, it's important to make your selection carefully. Although you aren't paying anything for the applique itself, you still have to purchase the rest of the project materials plus spend time creating your piece. Pay attention to the skill level as well as the style and instructions on any free appliques you select. Since many free appliques are available on crafters' personal blogs or websites, there may be some errors in the directions. Unlike craft stores and quilting supply shops, which can be another great source of free appliques, the copy isn't often proofread many times. When you choose a free applique on a personal crafting blog, always read the comments from other readers as oftentimes a mistake is noticed then corrected by the crafter. If you pick an applique that is straightforward enough to you that you won't need instructions, you can help avoid possible problems. Reading craft blog comments on sites that offer free appliques can also be helpful in gauging the satisfaction level of readers who have tried the patterns. Be sure to choose appliques that match your skill level though. Choosing a simple free applique to start, then increasing the detail and difficulty level per project can work out well. You don't have to create quilts to start, but rather could make a pot holder. Pillows and wall hangings are other great non-quilt projects for using free appliques available on craft blogs or store websites. Always match the applique's style to your project. The great thing about free appliques is that there are so many different styles from which to choose. Some of these are designed for traditional quilting looks, while other free applique offerings are quite unique and creative. Choosing free letter block appliques can personalize your crafting projects and these letters are available in romantic scripts as well as children's designs. You're also likely to find many holiday-themed free appliques. If you choose simpler styles, you may find that you can use the appliques for a wide range of craft projects other than quilting only such as woodworking and folk art painting. 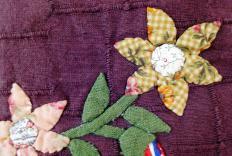 Sometimes, a simple free applique can inspire you to add your own special embellishments or additions to the pattern. For that reason, it can be a good idea to use a creative approach when choosing free appliques. You may find lots of wonderful uses for your applique patches. What Is an Applique Patch? What Are Carbon Fiber Dash Kits? What are Some Good Scrapbooking Gifts? What are Different Methods of Applique?